Dr. Ahn was born in Korea and came to the U.S. in her early teens. She grew up in Virginia where she attended the University of Virginia as an Echols Scholar with a major in music and a pre-medical focus. There she earned her B.A. degree with Distinction in 2001. Upon graduation, she spent a year participating in basic research at the National Cancer Institute before enrolling at Virginia Commonwealth University School of Medicine, receiving her medical degree in 2006. Dr. Ahn completed her internship at Drexel/Hahnemann University in Philadelphia, PA. Her internal medicine residency was at Northwestern University in Evanston, IL where she served as Chief Resident. She remained at Northwestern for her rheumatology fellowship in Chicago, IL. 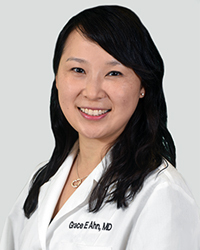 Dr. Ahn has received multiple scholarships and awards throughout her academic and medical careers, including Intern of the Month during residency and teaching awards during fellowship. She has been first author and co-authored several articles and abstracts, and presented research at regional, national, and international conferences, including the American College of Physicians, the American College of Rheumatology, and Osteoarthritis Research Society International. Her article on physical activity and systemic lupus erythematosus was recently published in Arthritis Care & Research. Dr. Ahn is board certified in internal medicine and rheumatology and is a member of the American College of Rheumatology. Her areas of interest include systemic lupus erythematosus, rheumatoid arthritis, osteoarthritis and gout. Dr. Ahn is married to a colon and rectal surgeon and has two children. She enjoys playing the piano, traveling, and spending time with her family. Accepting patients at both our Wheaton and Olney facilities.